The Yellow-legged Gull can be separated from the more common European Herring Gull by their characteristic yellow legs and details on the wings. Yellow-legged Gulls recently obtained status as a full species, after having been classified as a subspecies of the European Herring Gull. The Yellow-legged Gull has now been seen for the first time at Lista Bird Observatory. Yellow-legged Gulls look very similar to the more common European Herring Gulls and detailed knowledge about gulls and different species of gull is necessary to distinguish between the two. As opposed to the European Herring Gull, the Yellow-legged Gull is more common at Southern latitudes but is now frequently seen in North-Western and Northern Europe. 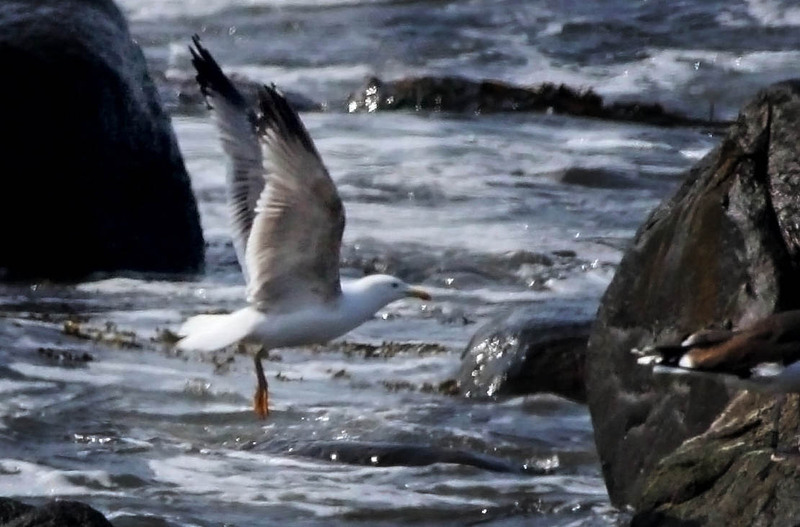 The bird was discovered on May 19th by Richard Cope, and this makes it the third time a Yellow-legged Gull is seen in Farsund municipality. Richard Cope and Jarl Marius Abrahamsen watching gulls feeding among the sea weed right next to the bird observatory noticed something different about a particular gull. Suspecting it could be a Yellow-legged Gull or some hybrid, they obtained good enough pictures to allow for a proper identification by the two Norwegian "gull gurus", Inge Flesjå and Stein Engebretsen. Apart from the characteristic yellow legs, the Yellow-legged gull has a broad black band on its fifth primary that can be used for identification. The back is also slightly darker than for the European Herring Gull, and size and shape are other criteria that can also be used. Judging from the size, this bird is probably an Eastern type from the Mediterranean. The Western type breeding on the islands in the North Atlantic Sea is slightly larger. Even though the Yellow-legged Gull has many features which reminds it of the European Herring Gull, DNA research has shown that it is more closely related to the Great Black-backed Gull and the Armenian Gull. Until recently, the Yellow-legged Gull was classified as a subspecies of the European Herring Gull, but has now obtained status as a full species.